• Check out the barebones shed that’s now a relaxing garden hideaway. • Have a thing for birdhouses? See how a Connecticut gardener paired her passion them—and incorporated a rescued church steeple—in her cottage garden. • Create a makeshift potting shed out of an old industrial locker (it’s easier than you think!). • Entertain al fresco and spend the afternoon hosting a potting party! 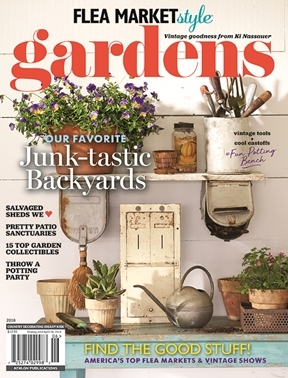 • If you count gardening with antiquing among your hobbies, then take an armchair visit to Trade Secrets, the annual show—and plan your pilgrimage to this bucket-list event.